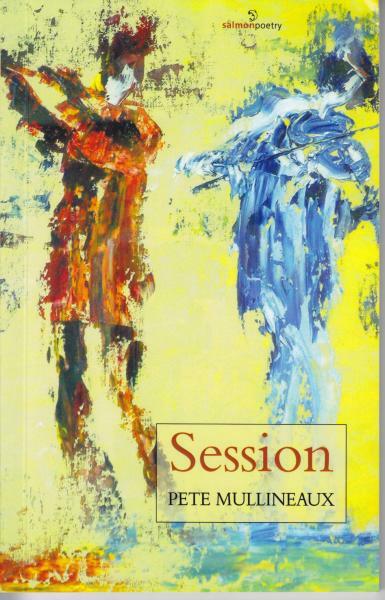 Session (the word used to describe informal gatherings featuring traditional Irish music) is Pete Mullineaux's second publication with Salmon. At age 13, his poem, 'Harvest Festival' appeared in Macmillan's anthology Poetry & Song and this latest col­lection continues a lifetime fascination with the twin worlds of poetry and music -(Pete plays guitar, mandolin and fiddle.) Here are lyric, narrative and song elements, exploring and celebrating the presence of music in human interaction and in nature — there is a particular empathy with animals -from starfish, spiders, dogs, and cows through to a whole range of birds. Paying tribute to the 'music' in poets such as Heaney andYeats along the way, this is an innovative, some­times humorous, but ultimately a serious and thought-provoking creative study. Pete Mullineaux originates from Bristol, UK. At age 13 his poem 'Harvest Festival' was published in two anthologies, Poetry & Song (Macmillan) and Man & His Senses (Harrap) as well as being recorded by Argo records alongside music and song from Ewan MacColl & Peggy Seeger. Living in London for several years, he worked in a left-wing printing press and was part of the alternative music scene with the punk rock band The Resisters, then as singer-songwriter, Pete Zero. Adapting to the emerging wave of performance poetry, he appeared in the Apples & Snakes anthology Raw & Biting Cabaret Poetry, (Pluto Press 1984) and won the City of London Poetry/song contest in 1986. In 1991 he moved to Galway with his partner and daughter, where he works as a creative writing facilitator and drama devisor with local and national community/arts/campaigning groups. He's particularly involved in development education and is a mentor on Poetry Ireland's Writers in Schools Scheme. His poetry has been pub­lished widely in Ireland, UK, USA and France - with two previ­ous collections: Zen Traffic Lights (Lapwing 2005) and A Father's Day (Salmon 2008.) Readings range from Cuirt International Festival of Literature to Electric Picnic, New York to Glastonbury. He also writes for the theatre and has had a number of plays pro­duced by RTE radio.